I’ve recently just upgraded from vCSA 5.1 to vCSA 5.5 link and found that Horizon View can no longer complete sysprep customization due to the public key being changed when you upgrade to a new appliance. Just edit the customization specification to fix. Hope this helps. Sometimes an opportunity comes along that is just too damn exciting to pass. 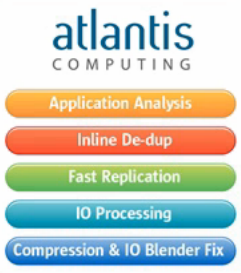 This is a short post on my latest move to Atlantis Computing from Canopy Cloud. My new role is primarily with the USX team to help drive the adoption of USX into large Enterprises and Service Providers. USX is Atlantis Computing’s newest technology which does for server workloads what ILIO did for EUC. Quite simply my job is to make USX a success. I’ll be helping the virtualization community understand Atlantis Computing’s USX and ILIO technologies, working with customers and partners and also with our technology partners, such as VMware, NetApp, VCE, Fusion-IO and IBM. Even though USX is new, the technology is based on ILIO which has been shipping since 2009 and is powering the largest VDI deployments in the world. Today was officially my first day and it was a pretty interesting one. It started with a customer meeting with a large bank in London and then to BriForum, both in a listening capacity but I couldn’t help myself and ended up talking about both ILIO and USX to some techies at the bank and then some people that came to the stand at BriForum. There is definitely hot interest with using RAM to accelerate storage in both EUC and server workloads. Atlantis Computing’s ILIO and USX technologies are truly software defined and in simple terms enables the in-line optimisation of both IOPS and capacity BEFORE the IOPS and blocks hits the underlying storage. For example the blue graph represents IOPS to the storage array for 200 VDI VMs without ILIO, the red graph represents IOPS to the same storage array with ILIO, a saving of 80%. In addition because storage is deduped in-line, there is also massive capacity savings on the underlying storage too. Dedupe occurs in-line, there is no requirement for dedupe to blocks written to disk as data is deduped before being written to disk, hence no overhead caused by a dedupe job on the storage processor or spindles. I won’t go into each one in this post, I’ll save that for another day. I’m very excited with my new role at a new company and hope to blog a lot more often as I learn more about Atlantis Computing and of course storage virtualization and optimisation in general. If you want to read more, some of these resources help explain the tech. Oh and we offer a completely free ILIO license for use in POCs/Lab environments, be sure to check it out!